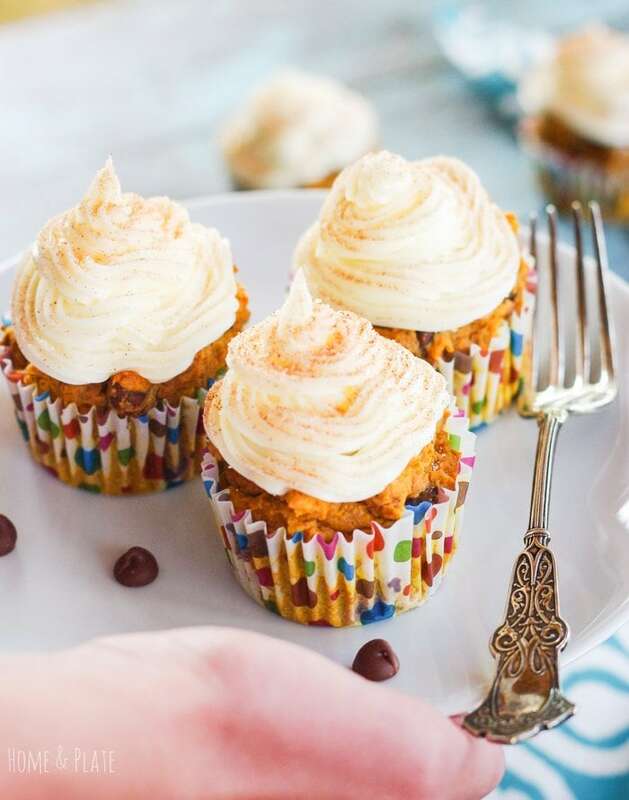 Delicious for fall, these moist and sweet pumpkin cupcakes are sprinkled with chocolate chips and topped with cream cheese frosting. Nothing spells fall and harvest time more than apples and pumpkins. 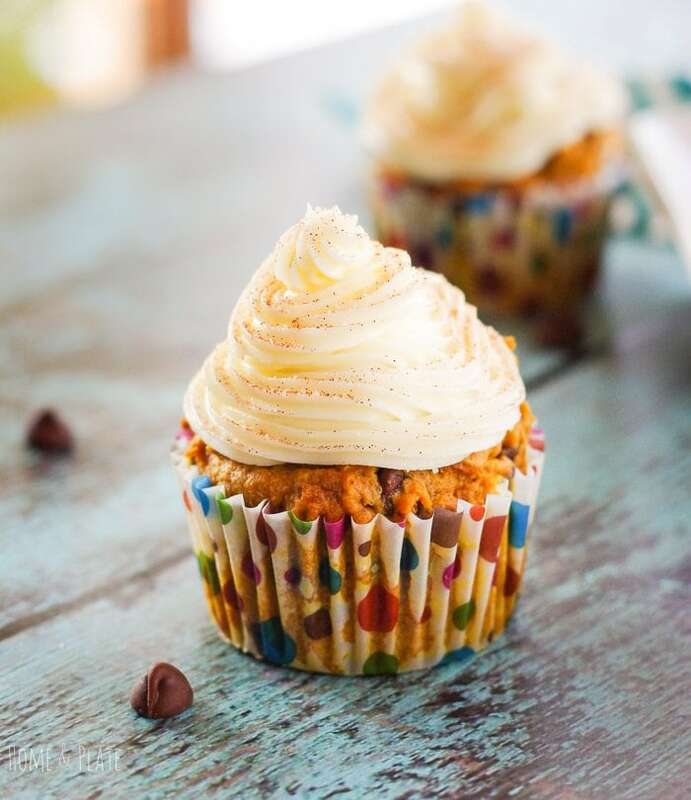 And back to school is the best time to make sweet treats that the kids can enjoy at the end of a busy day. My kids love my two-ingredient pumpkin spice muffins as an after school snack. 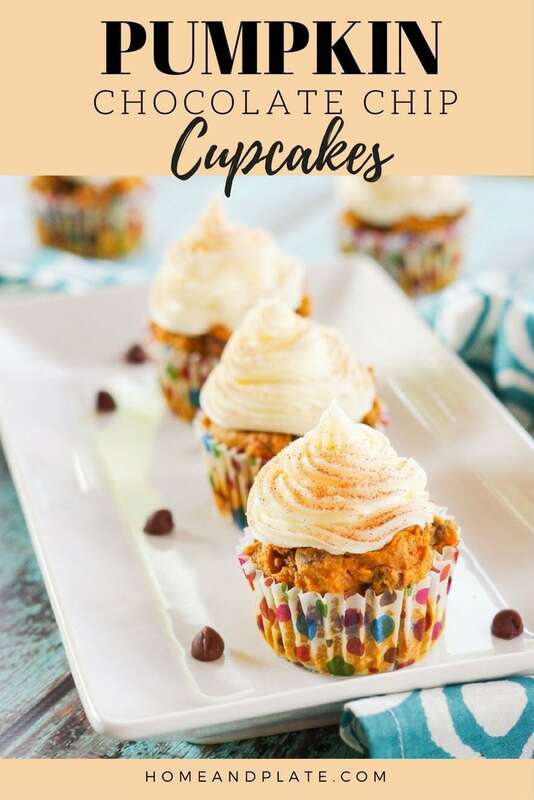 This recipe is similar with the addition of semi sweet chocolate morsels and cream cheese icing with a sprinkle of cinnamon. What I love about this recipe is that just about everything you need is something you already have in your kitchen pantry. I always have a can of pumpkin and a bag of chocolate chips stored away because you never know when you might need them. This recipe calls for one cup of canned pumpkin. My pups are always willing to finish off what’s left in the can. After all, I can not say no to those sweet faces. My recipe features four spices that complement pumpkin – cinnamon, ginger, allspice and nutmeg. If you have pumpkin pie spice, use a teaspoon of that instead. This recipe will still be delicious if you only have a few of these spices readily on hand. I like to sprinkle a little cinnamon on top after I have frosted these cupcakes. Who can say no to a fork full of this deliciousness? 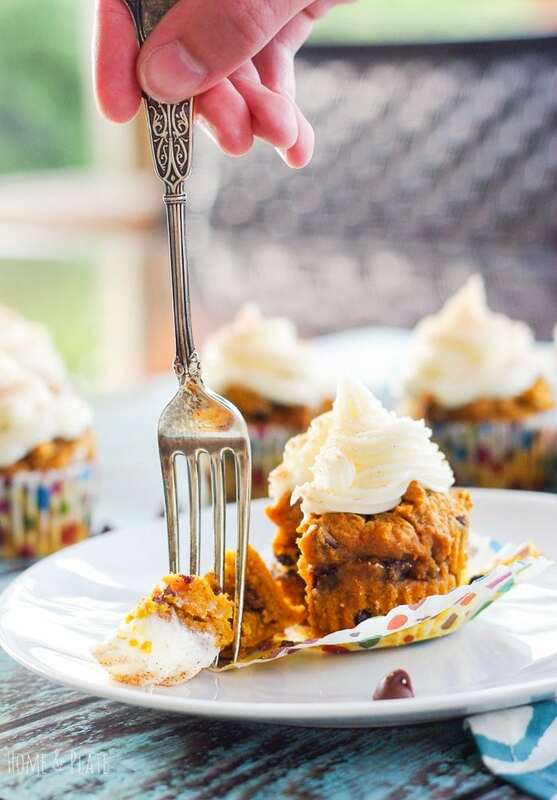 WANT TO TRY THESE PUMPKIN CHOCOLATE CHIP CUPCAKES? 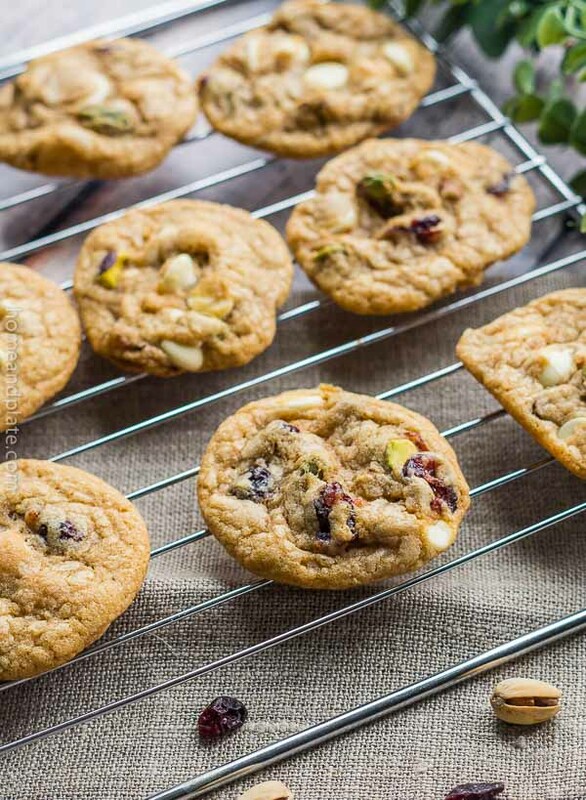 PIN THEM TO YOUR DESSERT OR FALL BOARD TO SAVE FOR LATER! Preheat the oven to 350°F. Line a 12-cupcake tin with liners. Mix together the dry ingredients in a bowl then add to the mixer. Combine until moistened. Fold in the chocolate chips. Pour the batter into the prepared cupcake tins, feeling 3/4 full. Bake for 18 to 23 minutes or until a toothpick inserted in the center comes out clean. Allow the cupcakes to cool for five minutes then transfer to a wire rack. In a separate bowl, beat together the confectioners sugar, the butter and cream cheese. Allow the cupcakes to cool completely before frosting. I always have a can of pumpkin in my pantry too! Great minds, you know? 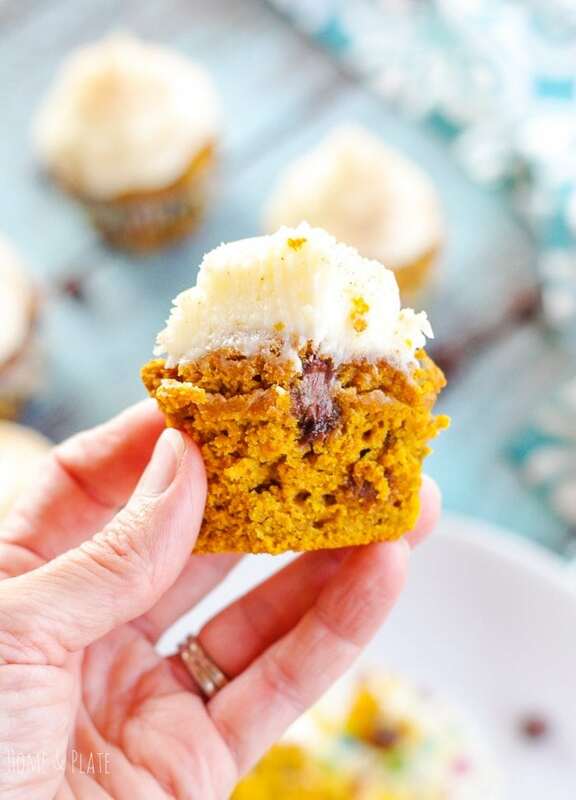 These are so easy to make, and I am ALL about that cream cheese frosting! I love anything with a cream cheese frosting! 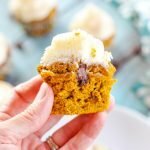 all about pumpkin right now, these are perfect! A great use of Pumkin for the season. The frosting is the perfect topping for that delicious sweetness. Overall really yummy looking. Thanks Helen. Tis the season…loving all the pumpkin and apple recipes. I am right there with you. My kids gobbled these up quickly. We can’t get enough pumpkin this season. Those look gorgeous and I love the flavours, but I am rather distracted by that fabulous fork. What a beauty! Oh and pinned! Thanks 🙂 It’s amazing what you can find in antique stores isn’t it. Thanks for the love on the pumpkin cupcakes.